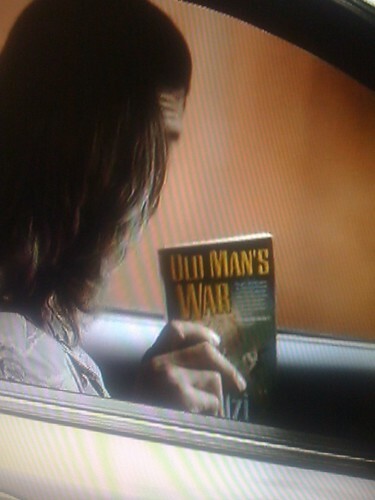 Yes, folks, I knew that Old Man’s War would get a cameo in tonight’s episode of Stargate Universe. It was very kind of them to give it one. Didn’t they have a Kindle version? Bribes? I was expecting some money bribes soon due to my now special status of a Nielsen family. LOL What’s sad is that I’m so honest in this endeavor that I recorded my ADHD viewing last night. Bizarre but true diary. I can’t lie. Dammit! How do people lie? According to Nielson, I just have to watch 5 minutes. K. Ummm…that leaves a lot of leeway in my viewing pleasure. I tend to flip alot. Last night I flipped from “The Newlywed Game”, “Little Big Man” and Rachel Maddow. Yeah, Nielsen asked me. It’s their fault. I saw it, it was awesome. I clapped a couple times and laughed, it was cool. Haven’t watched it yet tonight, so I’ll be looking for it!! What we really want to see is a stone John Scalzi statue on a planet they visit. Imagine the fangasam. If I open the image in a new tab Amazon s3 gives me “AccessDeniedRequest has expired” and some other stuff. On Macbook, can’t see image. Damn u Jobs! 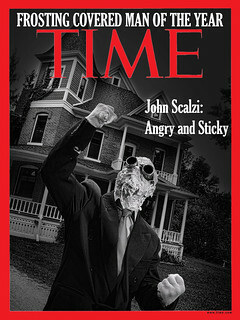 TwitPic has failed you yet again, Scalzi. Sheesh, SpoilerGate. I have it tivoed so lalalalalalaI’mnotlistening! As if the creative consultant gig wasn’t cool enough. Now can you get them to work “your hate mail will be graded” into the dialogue? That’s great, John. You should try to find out if it results in a bump in sales. Is it just me or does Richard Dean Anderson look way puffier on SGU than he did on SG1? @22 Mark: It’s not just you; I figured he’s put on weight. Better yet, have a Stargate team discover a race of sentient felines who dress themselves in bacon. So, I rock. Just sayin'. Haha, I saw it and I am like… I know that book! Good one, Your Deliciousness! I read Old Man’s War ~3 weeks ago. It’s my first Scalzi read. I liked it. And I just got SG-1 in my mailbox from netflix today. Starting at the beginning. I’m curious to know when you hopped on the SG team. I watched the first two episodes of SG:Universe as a Stargate virgin. I LOVED it but I had a problem. I had NFI what was going on at any given moment, and that was unacceptable. I remember seeing the beautiful blonde lady come arrowing down in a badass ship like a space-age Valkyrie. I had to know everything about her and how she got there. I realized that this was our Air Force, and then I had to know about that, too. So, I ordered up SG-1 and started watching it immediately. The thing about SG-1 is that the first season is a little, well, Pollyanna. Bad things get set up and then don’t really follow through. Crisis is averted for seemingly no reason at all sometimes. It was tough going at first. However, the payoff came about halfway through the season when they found their stride, and season 2 of SG-1 is all about consequences. And it just gets incredibly better from there. This is in Subversion? We are still waiting for Pain in the UK, next Tuesday. Never thought I would approve of product placement. Advertising at it’s best! That’s awesome they did it for free. People pay crazy money for product placements. Hey! I took that photo! I loved the product placement, however, I hope you now realize, Ghlaghghee may now desire to be presented for all admirers to gaze upon in TV Land. Indeed. Caturday in space. Please make it so. Those ticks wouldn’t have been such a problem if Destiny had been a crazy cat lady wonderland. I squeed! And giggled. And clapped. A good time was had by all. Also, double bonus – dropped by the library earlier in the day to drop off some books and totally squeed when I stumbled across The God Engines in the new book section. Yes, I’ve definitely had my recommended daily allowance of Scalzi squee today. And it is delicious. Our pleasure. And given the fact that we failed to sign you to an actual contract this season, please consider that little cameo your compensation in lieu of a proper cash payment. In season two, you may choose to be remunerated in either a Zoe’s Tale cameo or spiced almonds. I caught the cameo 1st time through, and yea, even being 38 years old, and male…I squeed. Yes, I admit it…very cool to see one of your favorite books make a cameo! Now if only they would adapt it into its own series! Seriously, why arent we all tuning in after SGU for “Old Man’s War”? 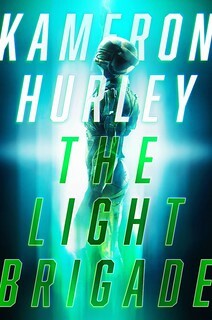 I read the series through 4 times already…I REALLY want to see this adapted into a movie or (preferably) a TV series!